My life after Othello has been pretty exciting – first, there was the Youtube Fanfest event which I blogged about here! 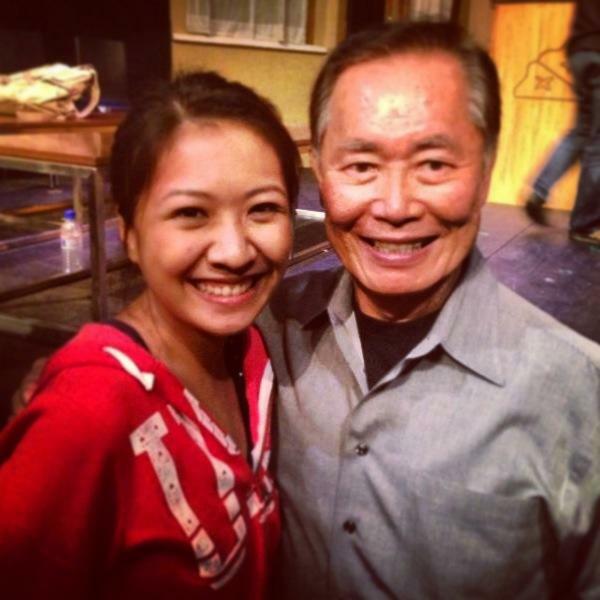 and then, it was meeting George Takei. Yes, THAT George Takei, the one and only George Takei. See how I relate everything back to Othello, sigh. When I look back on 2013, I know Othello is going to be the most amazing thing that happened in my calendar year. George Hosato Takei (武井 穂郷 Takei Hosato?, /təˈkeɪ/tə-kay; April 20, 1937) is an American actor and author, best known for his role as Hikaru Sulu, helmsman of the USS Enterprise in the television series Star Trek. He also portrayed the character in six Star Trek feature films and in an episode of Star Trek: Voyager. He is a proponent of gay rights and active in state and local politics as well as continuing his acting career. He has won several awards and accolades in his work on human rights and Japanese–American relations, including his work with the Japanese American National Museum. I’m going to be honest and say that when we got the email to see George Takei, I had to do a quick Google search just to double confirm. I don’t watch Star Trek, and haven’t watched any of the movies he’s been in, but was vaguely familiar with his witty Facebook posts which were reposted on my friends’ Facebook walls. Undoubtedly an impressive career, but Star Trek aside, I really wanted to meet him to hear him speak about theatre, his acting career (surely Star Trek was going to be mentioned at some point), how it’s like navigating in Hollywood as an Asian-American actor, and words of advice for aspiring actors like myself. It was a small group of about 20 to 25 or so, so we were really lucky, thanks SRT! We heard him speak for about half an hour or so, before he addressed questions from the crowd. I think I was most moved by how he was so open about his life – from his growing up years from how his family had to relocate to Arkansas to a relocation centre to his personal relationship with his father. It was so real and true, that when he was relating what he regretted the most and at that point, his hands were shaking and his eyes were brimming his tears, I myself was on the verge of tears. I am emotional like that, deal with it. He also talked about how these events shaped his outlook on life, and motivations and reasons on why he does what he does. I find that really beautiful about mankind and life, which I am blessed to see in many people around me, that when people are motivated and driven by any cause – be it, your love for nature, animals, to help fight poverty, or simply, the love for the stage and theatre. Because of that, I am not surprised George Takei has such an accomplished career and continues to inspire others (just check out his Facebook page here) Oh, and his voice…..sigh. And of course, looking ahead, George also shared details of his upcoming work: Allegiance the musical, which is going to be shown on Broadway. It also stars Leo Salonga, can’t get any better than that. Go watch if you’re in town! This entry was posted in Acting, Events, Shoutout and tagged acting, Actors, Allegiance, Allegiance musical, arts, asian, Broadway, George Takei, Hikaru Sulu, lea salonga, Oh my, singapore, Star Trek, Sulu, talent, Television, Theatre, young actors. Bookmark the permalink.